It’s pretty safe to say that the first permanent English colony in America was put together about as well as a soup sandwich. Those who set out to establish the colony weren’t sure where they were going or what to do when they got there. A group of investors known as the Virginia Company of London was given a charter by King James I to settle somewhere in the southern part of the New World area known as Virginia. After a voyage on which roughly 27 percent of the original 144 settlers died, three ships arrived at the mouth of a river they ingratiatingly named the James, after the king. On May 14, 1607, they began the settlement of Jamestown. Worse, the site they had chosen for a settlement was in a malaria-ridden swamp, and the local inhabitants were both suspicious and unfriendly. In fact, the Native Americans launched their first attack against the newcomers within two weeks of their arrival. Within six months, half of the 105 settlers who had survived the trip were dead of disease or starvation. Those who survived did so largely because of a character named John Smith. An experienced and courageous adventurer, Smith was also a shameless self-promoter and a world-class liar, with a knack for getting into trouble. On the voyage over, for example, he was charged with mutiny, although he was eventually acquitted. But whatever his faults, Smith was both gutsy and diplomatic. He managed to make friends with Powhatan, the chief of the local Native Americans, and the tribe provided the colonists with enough food to hold on. Smith provided much-needed leadership, declaring, “He that will not work neither shall he eat.” Without Smith, the colony may not have survived. As it was, Jamestown came pretty close to disaster. In the winter of 1609, called “the starving time,” conditions got so bad colonists resorted to eating anything they could get — including each other. One man was executed after eating the body of his dead wife. In 1610, the survivors were actually on a ship and ready to head home when a military relief expedition showed up and took charge. One of the biggest problems the colony faced was that the New World had nothing anyone in England wanted, so there was no basis for a profitable economy. But that began to change in 1613, when a fellow named John Rolfe came up with a variety of tobacco that was a huge hit in the mother country. Within a few years, Jamestown had a thriving cash crop. In 1619, three things happened in the Virginia colony that had a large impact on the British in America. One was the arrival of 90 women, who became the brides of settlers who paid for their passage at a cost of 120 pounds of tobacco each. The second was the meeting of the first legislative body of colonists on the continent. Known as the House of Burgesses, it met for about a week, passed laws against gambling and idleness, and decreed all colonists must attend two church services each Sunday — and bring their weapons with them. Then the legislators adjourned because it was too hot to keep meeting. The third event — three weeks after the House of Burgesses had become a symbol of representative government in the New World — was the arrival of a Dutch ship. 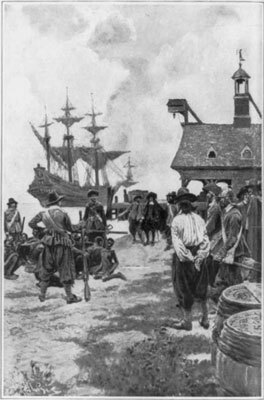 From its cargo, Jamestown settlers bought 20 human beings from Africa to work in the tobacco fields.